A: We can swiftly remove stains with either external window cleaning (for four-storey properties), rope access window cleaning (for multistorey properties), or via the well-known manual cleaning of interior windows. Q: Can you share with me a tad more about your water-fed rod cleaning method? A: Certainly! This equipment can stretch up to 22 metres in length, allowing the cleaners to easily reach and clean even the remotest corners of your windows. A: Our water is purified from any residue-causing elements. When this liquid vanishes under the sun, it won't leave any streaks behind. A: Rainwater is usually clean, so it won't deter us from doing our responsibilities. However, while we won't have anything against a slight sprinkle, a sudden cloudburst can lead to unsatisfying results. During thunderstorms, we may have to postpone our service for a day of your convenience to ensure the team's safety. A: No, the trained window cleaners in Stockwell can easily perform external window cleaning in your absence, as long as your property gates are unlatched. And if you want your windows to shine on the inside, just book our complimentary key pick-up and delivery option instead. With our window cleaning in Stockwell, you get a meticulous clean of your sash windows, skylights, glass roofs, French doors, and other glass surfaces at modest rates. We will even present you with a complimentary polish of all PVC & UPVC frames and sills! For a complete list of our prices, please see our price table below. 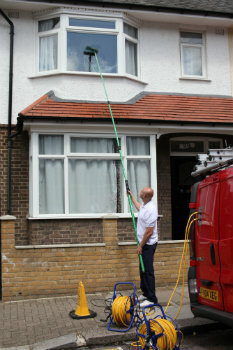 Depending on your needs, our window cleaning Stockwell can offer you with three choices. If you pick exterior cleaning, the technicians will utilize a special water-fed pole. This equipment can expand up to 22 metres in length, which is comparable to the height of a four-storey building. The Stockwell window cleaners will use filtered water under high pressure that will blast away all stains in almost an instant. If you run a lofty property instead, then have a loot at our rope access window cleaning. There, a team of certified abseilers will diligently shine your windows until they witness the image of the setting sun. For your peace of mind, we inspect the washing equipment on a day-to-day basis and can offer COSHH reports at your request. For interior washing, the specialists will bring ladders and squeegees to ensure that even the highest corners will get proper treatment. Over time, we've answered the cleaning calls of customers from many neighbouring regions. As a direct result, we broadened window cleaning Stockwell's horizon and you can now spot our cleaning vans in the districts below. Alternatively, get a free instant quote or order affordable window cleaning services Stockwell SW9 online, through our web site.